Vertigo is a not a condition; rather it is a symptom. It is a sensation of losing balance and the world around you seems spinning. It is often a presenting symptom of an underlying condition. Attacks of vertigo can develop suddenly and last for a few seconds or longer. Also Read : How to have a healthy life without anxiety? Peripheral vertigo caused by problems with the balance mechanisms of the inner ear. Central vertigo caused by problems in part of your brain. Multiple sclerosis, Head trauma and neck injury can often be the most common causes of vertigo. Cervical vertigo can be caused by inner ear, head or neck trauma. 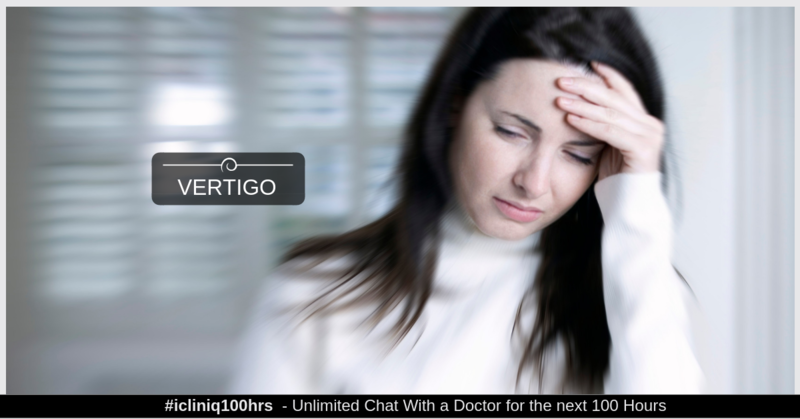 Vertigo can also be caused by Migraine which is a severe form of headache. Arteriosclerosis (hardening of the arteries) is a common complication of diabetes. It can lead to lowered blood flow to the brain, causing vertigo symptoms. Hormonal changes during pregnancy along with low blood sugar levels can cause pregnant women to feel dizzy, especially during the first trimester. In the second trimester, pressure on blood vessels from the expanding uterus may be the cause of vertigo. Later in pregnancy dizziness and vertigo may be caused by lying on the back which results in the weight of the baby to press on a large vein that carries blood to the heart. Also Read : Stress in a Broad Perspective - More Than Merely a Mental Illness!! Anxiety or panic attacks may also lead to a person developing the sensation of vertigo. Stress may worsen symptoms. Dizziness and vertigo may also be felt after travel by ship or boat and in some cases, after getting out of a plane, car, or train. Benign paroxysmal positional vertigo (BPPV) that may be initiated by sudden head movements or moving the head in a certain direction is the most common form of vertigo and causes a very small sensation of motion that can last from 15 seconds to a few minutes. Inflammation within the inner ear (labyrinthitis or vestibular neuritis), is often characterized by the sudden onset of vertigo. It may also be associated with hearing loss. Viral and bacterial inner ear infection is one of the most common cause of ear inflammation. Viruses responsible for causing labyrinthitis or vestibular neuritis include herpes viruses, influenza, measles, rubella, mumps, polio, hepatitis, and Epstein-Barr virus (EBV). Meniere’s disease which is a triad of symptoms including episodes of vertigo, ringing in the ears (tinnitus), and hearing loss. The precipitating factors of Meniere’s disease are not entirely inferred but are presumed to be due to inner ear infections mostly viral or allergies, injury to the head or some hereditary factors. One of the unusual cause of vertigo is acoustic neuroma as it is frequently assumed to be connected to an inner ear nerve tumor. Questions asked by medical practitioner. Hearing tests: Audiometry test, Tuning fork test. Videonystagmography – can indicate a problem with the organs that help you to balance. Vestibular rehabilitation – Strengthening the vestibular system by means of physical therapy. Canalith repositioning maneuvers – Guidelines from the American Academy of Neurology recommend a series of specific head and body movements for BPPV which can be done under the guidance of a doctor or physical therapist. There are various variations to the technique that can also be used under proper guidance from the doctors and physiotherapists. Medicine – Medication may be prescribed for symptoms such as nausea or motion sickness associated with vertigo. Avoiding salt and taking diuretic therapy to decrease the amount of retained body fluid volume which could accumulate in the inner ear. Stay away from smoking tobacco, alcohol, caffeine and chocolate. *Disclaimer: The above information has been prepared by a qualified medical professional and may not represent the practices followed universally. The suggestions listed in this article constitute relatively common advice given to patients, and since every patient is different, you are advised to consult your physician, if in doubt, before acting upon this information. Lupin Limited has only facilitated the distribution of this information to you in the interest of patient education and welfare. Q: I have a static sound in my ears after I was exposed to a gunshot noise. Kindly advise. Q: Why is there numbness in left side of chin in a metastasizing breast cancer patient?